My search for the perfect (day) moisturizer still continues. I have yet to find one that is light enough that it absorbs quickly so that I don't have to wait ages before moving onto my makeup, but also moisturizing enough to take care of the pesky areas on my face that end up flaking and causing my makeup to cling onto them in dry patches. Of course, for it to have added SPF would be a lovely bonus too. 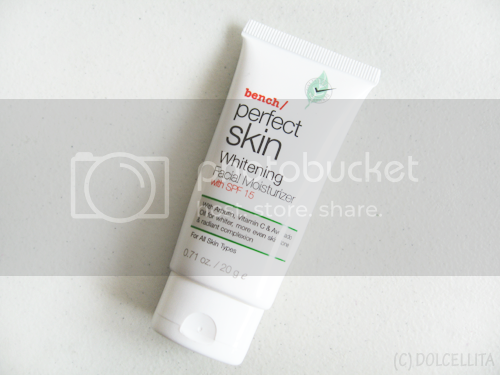 With that, I decided to give another quite recent find of mine a shot: Bench's Perfect Skin Whitening Facial Moisturizer. This is one of the products from their 'Perfect Skin' line that also consists of a face wash, toner, and serum. I heard the entire line is specially formulated for men, but I've only seen that info come from one source and it isn't specified on the packaging or anywhere else so I'm not entirely sure that it is. Enriched with Arbutin, a whitening agent that optimizes and evens skin tone for visibly lighter and fairer skin. The product comes in a simple squeeze tube that holds 20g of product. It's quite small and I managed to finish the entire thing within 2-3 weeks (using it daily, once a day), but it is very affordable. Enough so that you can stock up on this and buy a couple or even a few tubes at once if you like it. This is generally the amount I use every morning. When my skin is feeling drier than usual, I add a bit more to it. The texture is like your typical moisturizer and isn't too thick which makes it perfect for day use. It absorbs into the skin quickly, usually 5-10 minutes for me even in a non-airconditioned environment, but of course it will take longer if you're somewhere hot and humid. The scent reminds me a lot of sunscreen, which I personally don't mind especially since it's not very strong. I didn't notice any visible whitening or brightening effects as of yet either. It does moisturize my skin well, but it's just not enough for the more dry areas of my face like my cheeks and around my nose sometimes since I still experience some of my makeup makeup clinging onto dry patches or there's still some flaking. However, I did find a way to remedy this somewhat by using it in tandem with iWhite Korea's Facial Cream (review to be posted soon). Applying the latter right after the moisturizer's been absorbed really helps. So far though it's the most effective day moisturizer I've used and I'm already planning to get another tube asap, but I'll still be on the lookout for better ones! Absorbs into the skin fully in a short amount of time. Contains SPF15. Enough protection for a couple of hours under the sun if worn alone. Does not make my skin/t-zone oilier. Not moisturizing enough for me overall when my skin is especially dry, but I have found a way to remedy this (using in tandem with iWhite Korea Facial Cream cream or double moisturizing). I wish this either came in a bigger tube or was at least available in other sizes. Smells a lot like sunscreen which some may not like. No visible results yet concerning whitening or brightening. This looks like a good, affordable moisturizer! 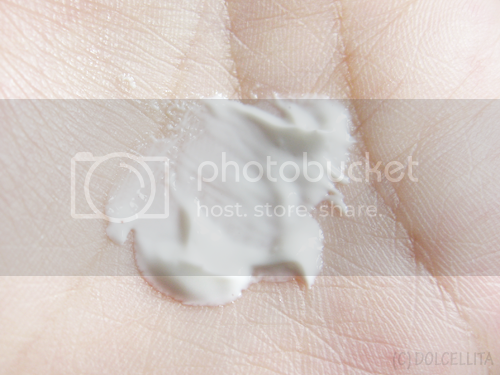 My skin does get really dry and flaky sometimes (more often than not... haha. ), so I don't think this is the moisturizer for mee.. ;n; Thank you for the review! @June L. You're welcome! :) If my skin was more normal-combination, then this would be the absolute perfect moisturizer for me. @Ileana As someone who lives in a country where it's practically summer everyday, I can vouch that it is good to use for the hotter months definitely. Especially since it's not heavy, has SPF, and absorbs fast. hmmm ya I'll leave sunscreen smelling like sunscreen rather than the moisturizer thanks so much for sharing the review!! This might be good for my combination skin if you said it's not moisturizing enough...On the other hand, you should check out Embryolisse, they make awesome moisturizer for dry skin. What a bummer that it didn't work as well as you had hoped! :( Good luck on your journey to find the perfect brightening cream! @Caity @ Moi Contre La Vie I'm just hoping to find the moisturizing cream of my dreams, haha. But thanks! Jilly I have combination skin too. Oily t-zone, dry everywhere else. If your skin isn't as dry as mine though, then this would definitely be good for you. @Jilly I have combination skin too. Oily t-zone, dry everywhere else. If your skin isn't as dry as mine though, then this would definitely be good for you. I've heard good things about the Embryolisse moisturizer, but sadly we don't have it here. I might purchase it online one day though. Oh really interesting product is the first time than I see this brand sweetie! not a huge fan of whitening creams unless they use natural ingredients like licorice, konjac or rice bran or something. The ones with hydroquinone or bleach can be really dangerous. Glad if it works for you though! If you want a more natural one, Komenuka Bijin makes a lovely Whitening Serum! @Janet I like it too. Sometimes neat and simple packaging is a refreshing thing to see. @Rosalie B.Tangonan It's a light formula, so it is refreshing to use in that sense. Definitely not heavy. @Gen-zel Yeah, SPF is always a good bonus, especially in this country! @cindy tong I haven't tried a gel type moisturizer yet, but I'm already eyeing a few of them. I've never used a whitening cream before. I wonder when you will start to see the whitening effect? 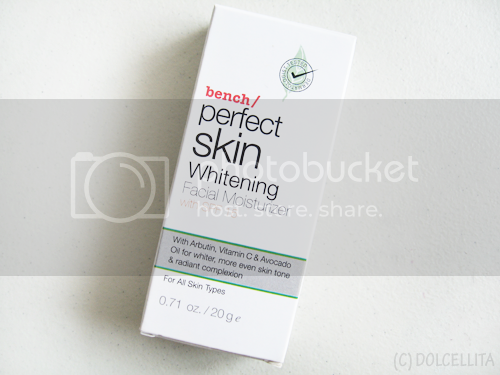 Bench has a very limited skin care line, but so far the products are quite good. I've tried the Total Effects moisturizer too, but for me it was a bit too heavy even if I was using the day cream. It did hydrate my skin pretty well though, it's just not something I can use when I'm in a bit of a rush. Maybe after some time the effects will appear, but I doubt they'll be very visible since I'm already fair skinned so the most I'll get is a brightening effect instead of whitening. In terms of my skin care then yeah, I don't usually put a lot of product on during the day since I already apply quite a lot of makeup. After washing my face, I only apply toner then a moisturizer (sometimes I need to double moisturize though, so I use two different kinds) before my makeup. At night, before bed, is when I have to use a lot more products such as moisturizer again, serum, acne cream, etc. @Maxinne Marie Since it's the best day moisturizer I've tried in a long while, I'm actually including it in my next article! @Kajsa Josephine Andersen You're welcome. Glad you found it helpful! @Carizza Chua I do recommend it! It's affordable enough to at least try out too. Looks interesting! Im always on the look out for creams, it seems a good size to trial it, thank you for reviewing! I have one pigmented sun spot on my nose, but so far no change at all with it.